Solid steel obelisk is enlivened with dramatic swirls. Perfect for climing rose and clematis combos. Powder coated black. Shipped knocked-down. Easily assembled. 94" tall x 21 1/2" diameter. Measurement from bottom to first rung is approximately 12". Great addition to our garden! We ardered two of the extra large tuteurs. They are so pretty with the running flowering vines all over. We are so pleased with the extra large size because of the impact they make to that area of the flower beds. They are extremely sturdy and were easy to assemble. Item was exactly what we were looking for. No one in our area had anything like it. I was happy with the ease the tuteur went together and the way it looks in my garden, however the all of the screws have rusted after only one week in the garden. I bought this trellis to replace a tubular umbrella trellis that was supporting a very large wisteria. The tubes rusted through and everything went down in a wind storm. 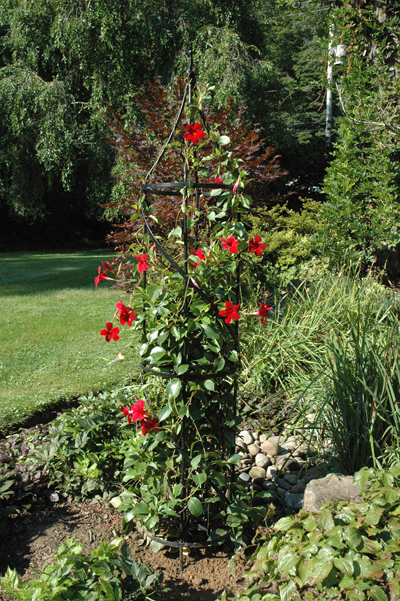 This trellis is tall enough not to impede gutter cleaning, yet beautiful, graceful and strong - this one will not rust through! I would recommend two pairs of hands to assemble though. I am only 5 foot tall and it was a job and a half.